This holiday season I am blessed to have my health, loving family, boyfriend, wonderful friends, new business endeavor, and yoga practice to bring me serenity under times of uneasiness. Whether it is Thanksgiving, Christmas, or any other holiday it is common that we eat until we are full. If we eat large amounts of food, our body has to work extra hard to digest that food. Here are some tips to make Thanksgiving even more enjoyable! Don’t skip breakfast. Many of us think since we are going to load up at our Thanksgiving meal, we skip eating beforehand. This slows down our metabolism and makes us over eat. Try to stop eating when you are 75-80% full so that your stomach has an easier time digesting your food. You will then realize this is your point of satiety. When you are done eating, clear your plate so that you do not continue to keep on picking. Drink half your body weight in water, sometimes you are thirsty and not hungry. Go for a stroll after dinner. We all know turkey makes us sleepy, so why not get some fresh air, instead of sitting down on the coach and watching tv. Lastly, enjoy the holiday with your family and friends. While this is a time to indulge in Nana’s pumpkin pie, do not eat too many sweets that you are already planning your new years resolution to lose the holiday weight. 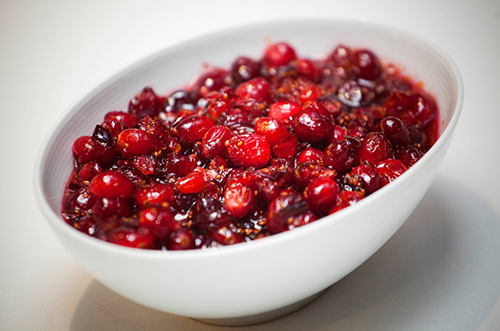 Cranberries are a rich source of Vit C, fiber and loaded with antioxidants. Next → Next post: Come join Simply Healthy Living’s New Facebook Group!